Paragliding a new type of adventure course in Nepal and it is getting most popular as other major activities. Paragliding is a truly fantastic and pleasing that any adventure lover can feel or experience. It is the purest form of flying by using the elements and rising currents of warm air, we can stay aloft for many hours and travel long distance. This simple craft fits easily into a rucksack and weights about 10kg with full experience of the extreme scenic dignity, as your share airspace flies near the Himalayan as a griffin vultures, eagles, kites, floating over the villages, monasteries, temples, lakes, and jungles, with a fantastic view of the magnificent Himalayas. It will allow you to see landscapes through bird eye views. It follows on from the Thermalling course, as pilots master the skills of ridge soaring and turn their attention to thermal flying, the focus leads to cross country flight. The challenge and adventure of flying in unfamiliar surroundings is unbeatable. However, flying in the mountains requires a more advanced flying technique. This 3 day course aims to give an introduction to mountain flying with the objective of looking at the necessary skills and decisions that give us the best chance of thermalling away from the familiar environment of the ridge to the freedom of the open skies. For best paragliding, it depends upon weather condition. The flying season in Nepal commences from November to February. But the best months is between November and December. The main area for flying in Nepal is the Annapurna region, more specifically the Pokhara valley. The micro-climate of the valley makes it an ideal area for flying, with far more constant conditions than the Kathmandu valley 150km east. 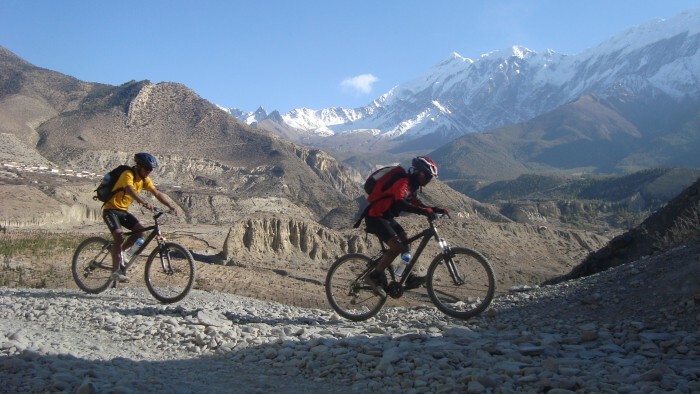 The gliding is offered in Mahabharat range however, the more is done in Pokhara, the beautiful lakeside town at the bottom of the Annapurna Himal. The starting point for the flight is Sarangkot (1592m), which offers great views of Fewa Lake, where the sunrise and sunset rays land in. If you want to have paragliding, you do not need to have experience, as the qualified pilots will provide you full briefing before you launch. If you want to have funs with gliding why don't let us serve you. Glider in good condition, all equipment is checked by the instructor before the course. Reserve, a repack session the night before the course starts showing you how to pack your own reserve. Harness in good condition, with back protection removed, and any airbags disabled.